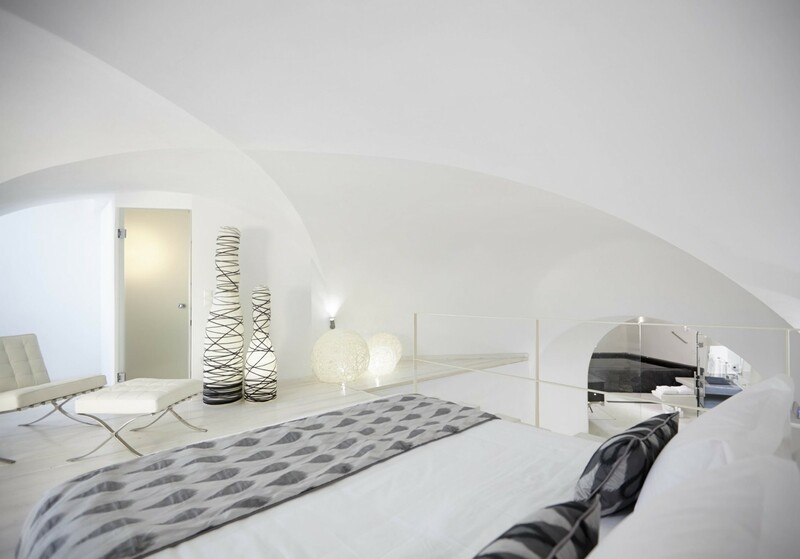 Welcome to Ariadne Villa, our luxury one-bedroom residence in Imerovigli on the stunning island of Santorini. 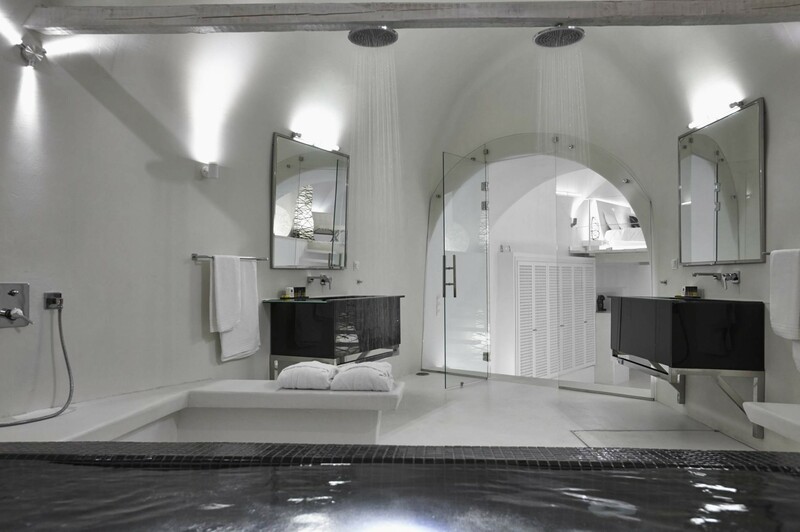 Ariadne Villa offers, quite simply, the ultimate escape in romantic luxury. 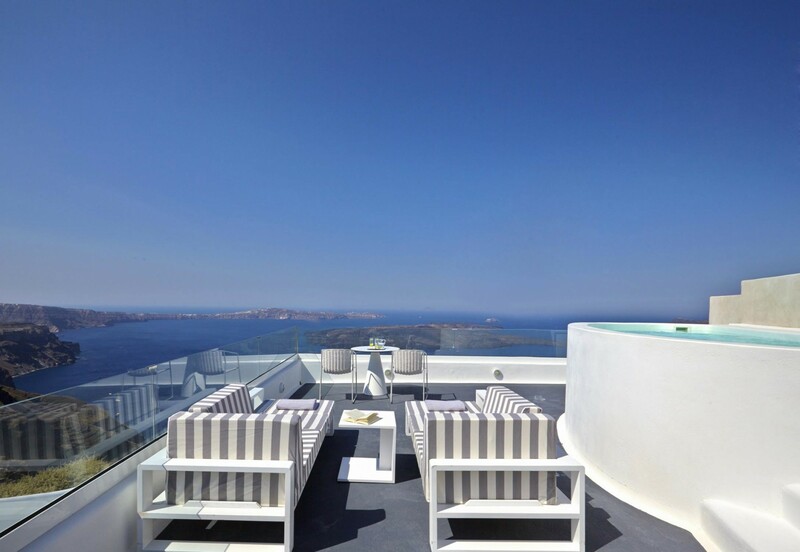 This beautifully private villa sits majestically on the highest point of the famous Caldera, overlooking the Aegean Sea. 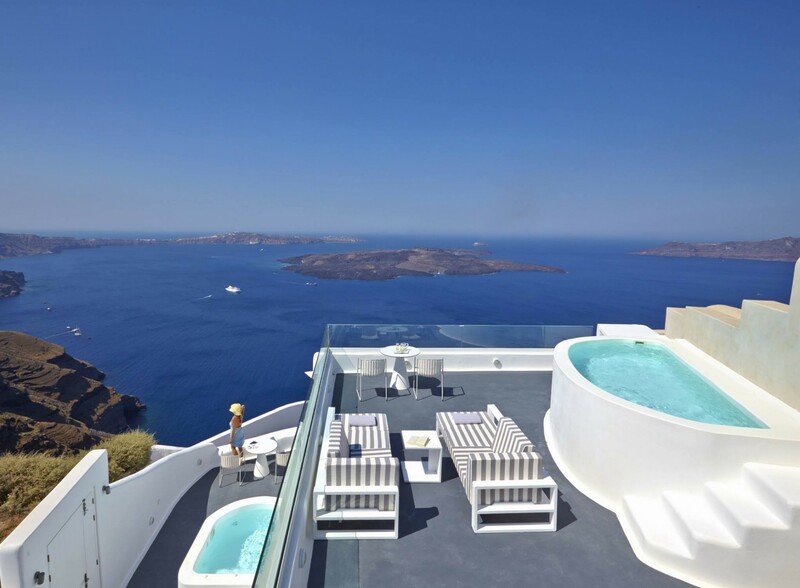 Ariadne Villa is the perfect viewpoint to experience the world-renown and sensational sunsets of Santorini. 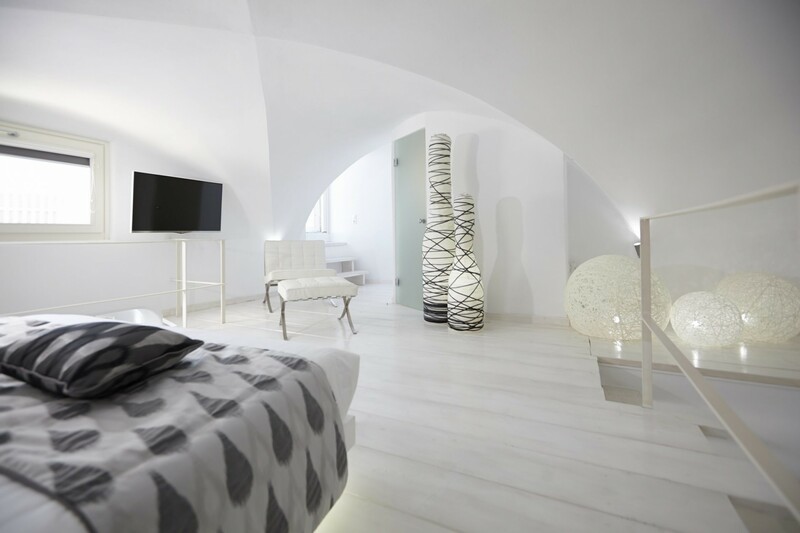 Ariadne Villa is minimalistic yet modern in its design, a style very typical of Greek luxury, with fresh white-washed and curved walls. 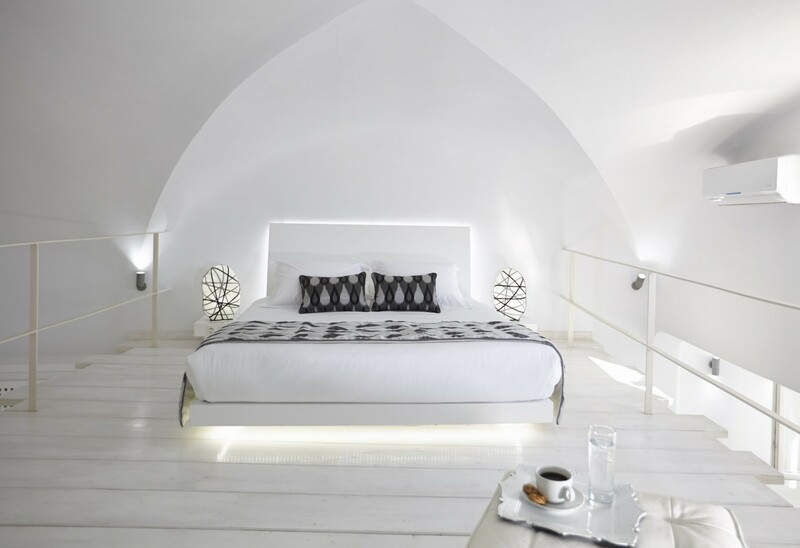 The luxury finishes, creative use of space and breath-taking views and make Ariadne Villa the perfect couple’s getaway. 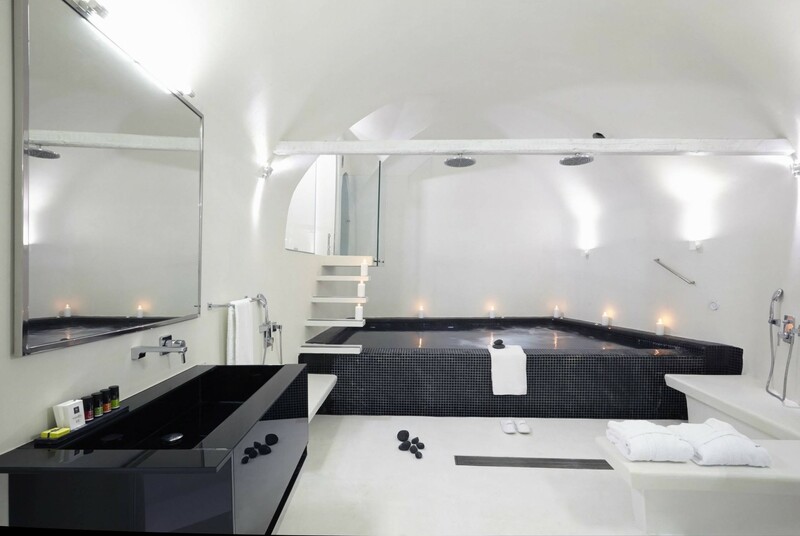 Ariadne Villa’s exceptional amenities include the upper veranda with private heated swimming pool, a heated outdoor jacuzzi on the primary private terrace and an indoor heated swimming pool with hydro massage jets. Both terraces boast sea and volcano views. The lower terrace also features a table and chairs and parasol – ideal for al fresco dining – while the upper level has sofa day beds, sun loungers and a table and chairs. 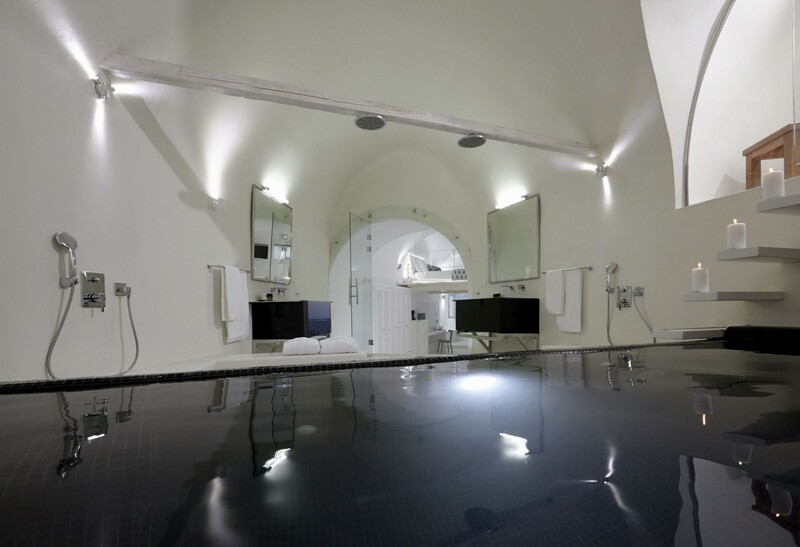 To add to all of this, there is also a beautifully tranquil steam room with complimentary essential oils to help guests and their loved one to relax and unwind. On entering Ariadne Villa from the upper terrace and jacuzzi, guests are greeted with the bright and spacious open-plan living area. 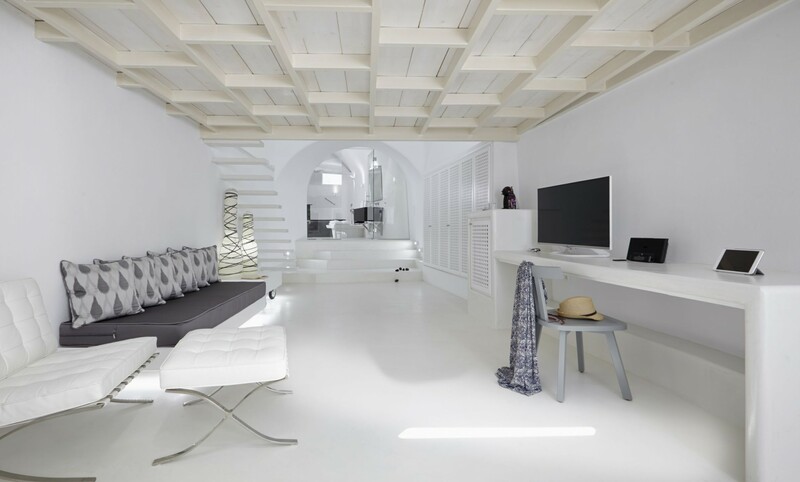 Sunlight bounces from the walls, highlighting every corner of this tastefully-designed home. 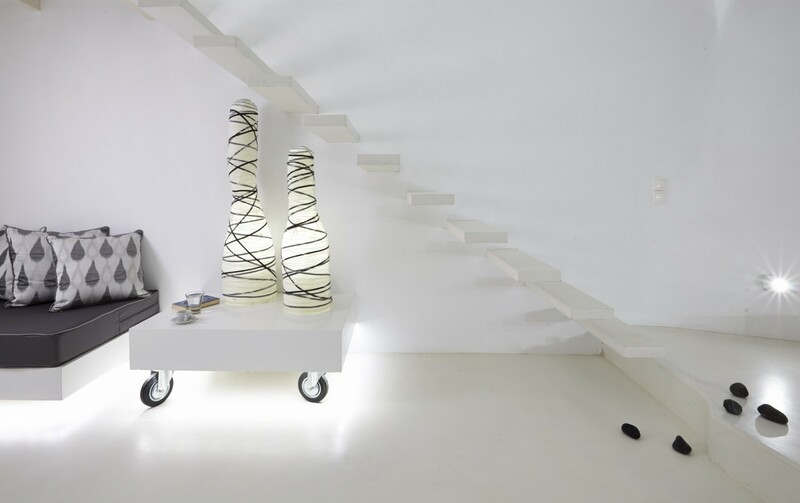 A work desk with radio and speakers, storage cupboards, an LED 42’’ television and a small sofa complete this level. 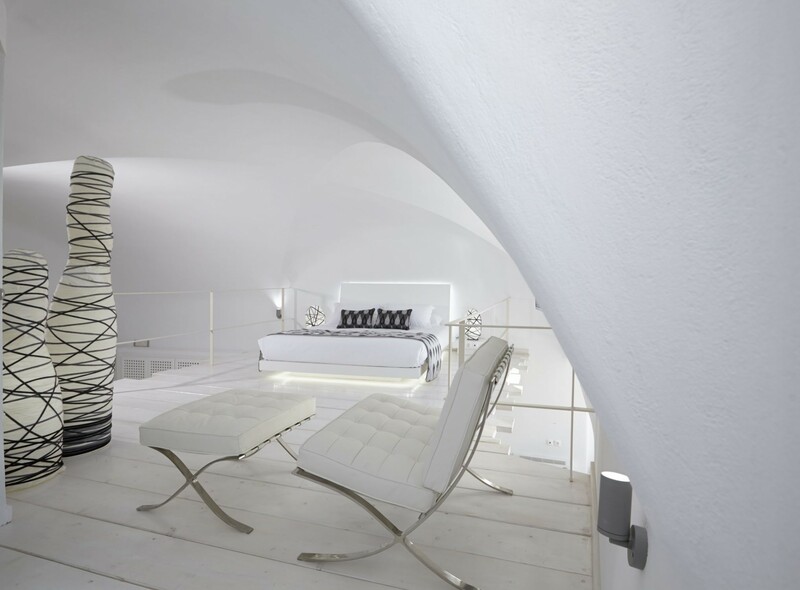 Steps lead up to the mezzanine bedroom with comfortable king-sized bed and a sleek en-suite bathroom. The open design loft has soft wooden floors, adding warmth and a homely feel to this otherwise very contemporary residence. 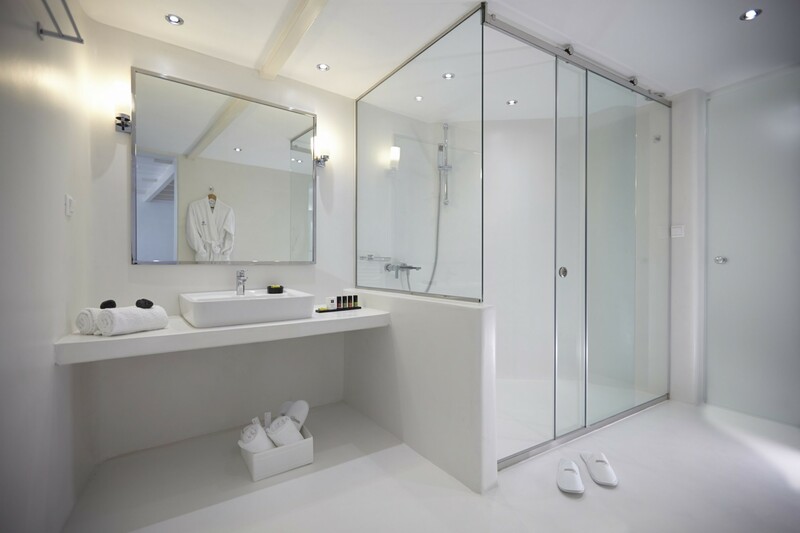 The en-suite bathroom at Ariadne Villa is possibly the main highlight, a real treat, with dazzling indoor jacuzzi with rain shower feature, walk-in glass shower for two and steam room with delightful essential oils and plush robes and slippers. This upper level affords direct access to the private terrace with stunning sea views. The sun loungers here are the perfect position from where to watch the evening sun. The matching quaint table and chairs is also an exquisite spot to enjoy mid-morning breakfast, served daily to guests at Ariadne Villa. 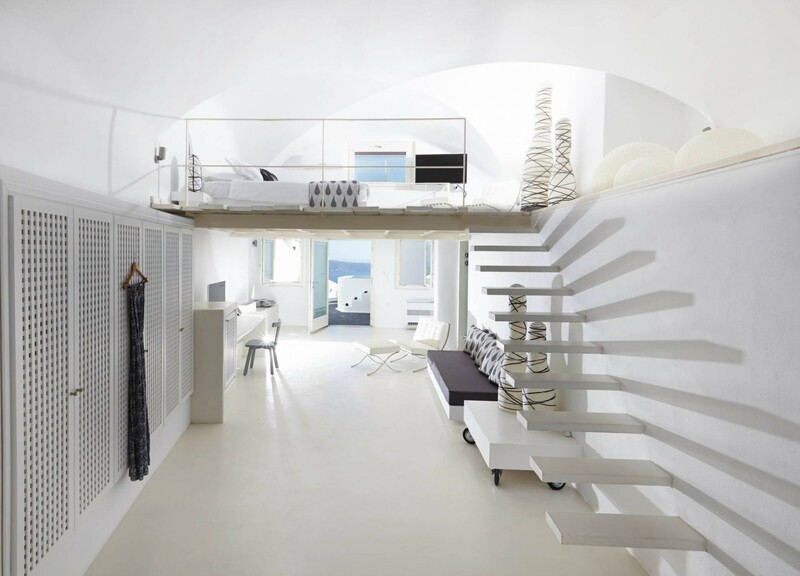 Ariadne Villa has a fully-stocked mini-bar with complimentary bottles of water and toiletries, beach towels, luxury robes and slippers are all provided. Guests can also request to have an infant’s cot set up at no additional charge. 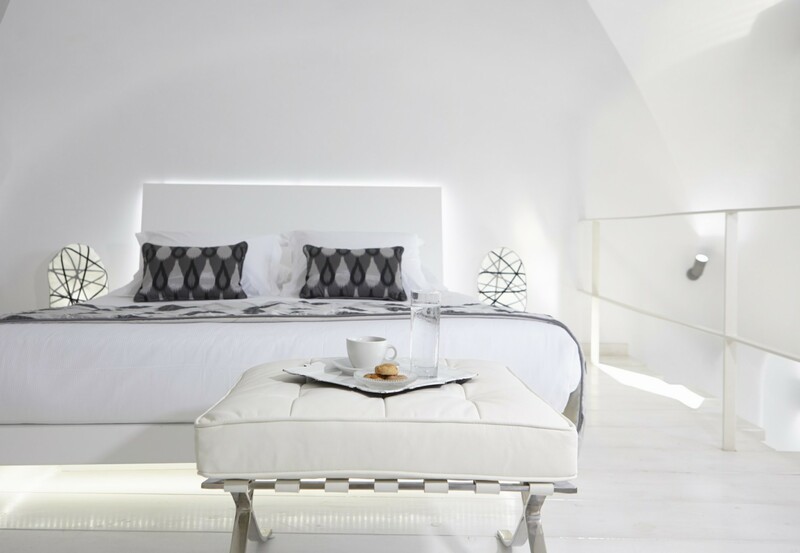 Guests are welcome to choose from a selection of pillows from a menu to suit their personal preferences and the duvet is of a comfortable micro-fibre. 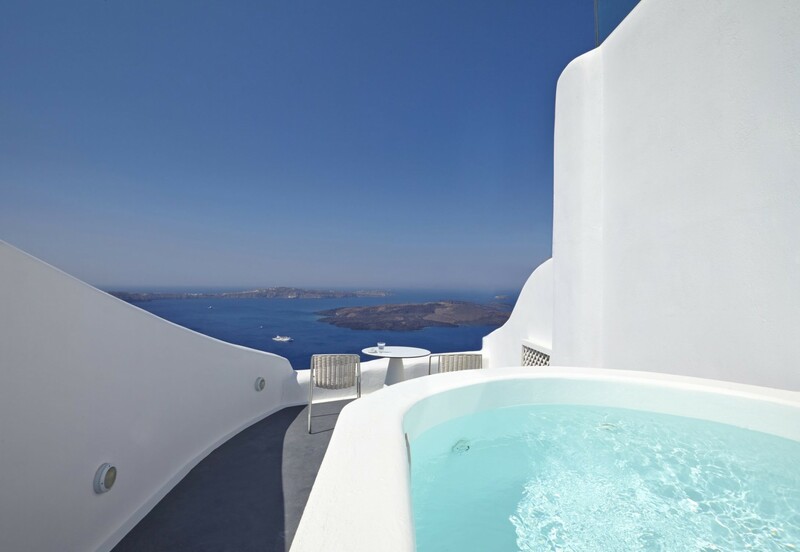 Ariadne Villa is a tranquil and private luxury villa overlooking the Aegean Sea, located in Imerovigli, Santorini. 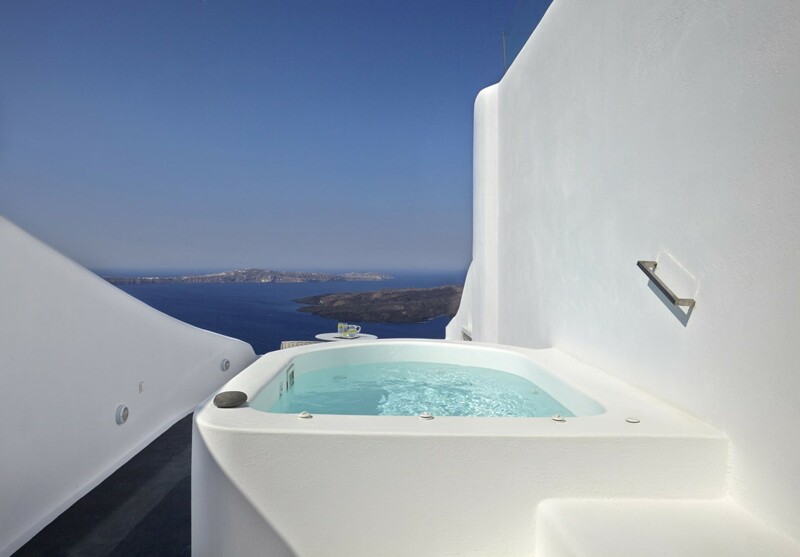 This splendidly romantic villa is sitting on the highest point of the famous Caldera, nestled in the heart of Santorini. 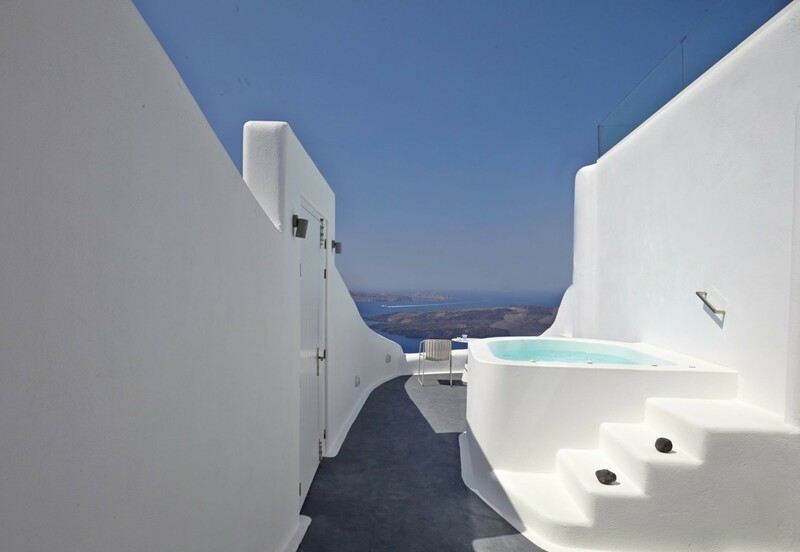 Ariadne Villa is situated in the village of Imerovigli, a small village adjacent to the north of the island capital of Fira. Imerovigli is most famous for its beautiful sunsets, known as ‘the balcony to the Aegean Sea.’ The houses in this quaint village are built amphitheatrically around the Caldera. The town is charming and peaceful with less than 500 permanent inhabitants. 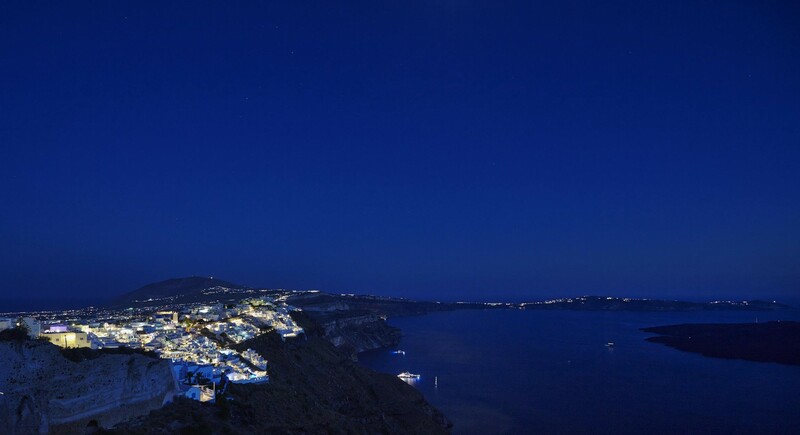 It is a short 2 kilometres from the larger town of Fira. 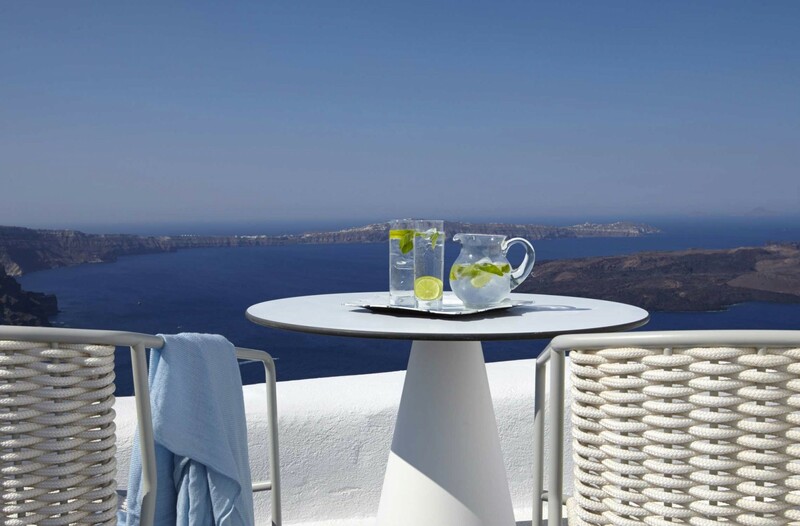 Ariadne Villa is a tranquil and private luxury villa overlooking the Aegean Sea, located in Imerovigli, Santorini. 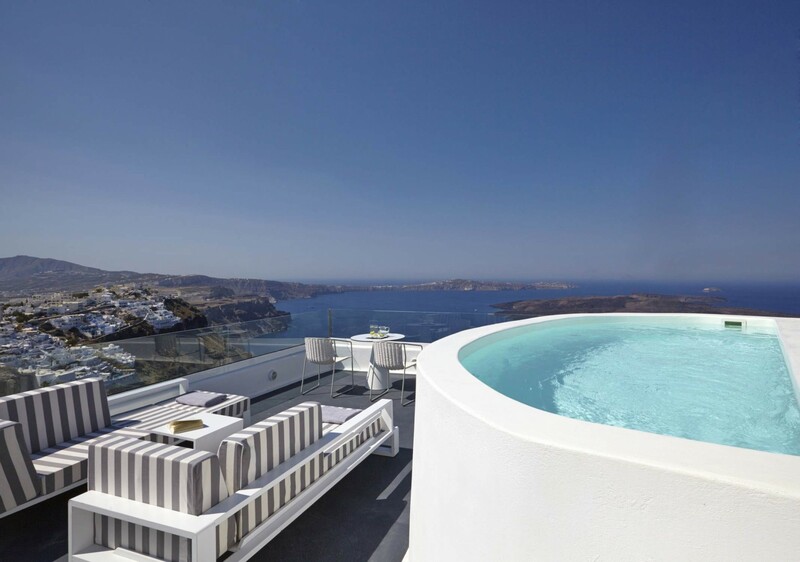 This splendidly romantic villa is sitting on the highest point of the famous Caldera, nestled in the heart of Santorini and is ideal for a honeymoon couple. It is a short 2 kilometres from the larger town of Fira and the closest shop is a mere 100 metres from the villa. The sandy beach of Exo Gialos is located 5 kilometres, a short 12 minutes’ drive, from this residence. Santorini Airport is only just over 8 kilometres from the Ariadne Villa and Santorini Port 10.5 kilometres, taking away the stress of a long commute after arriving in Santorini. There is a delightful array of activities to part-take in close to Ariadne Villa, including swimming, snorkeling, kayaking or simply hiring a boat to cruise the crisp salt waters.